2 of 3 In a medium saucepan, melt butter over medium heat. Add garlic and sauté 1 minute. Stir in flour and cook 1 minute more. Whisk in milk, pesto and salt; bring to a simmer and cook 6 to 8 minutes or until thickened. 3 of 3 Meanwhile, add agnolotti to pot of boiling water and cook 2 minutes. Stir in asparagus and cook another minute. Add thawed peas and cook 1 minute more. Drain agnolotti mixture; return to pot. 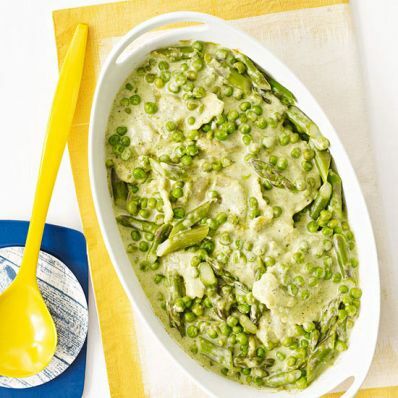 Stir in pesto sauce and transfer mixture to a 2-quart oven-safe dish. Bake at 350 degrees F for 25 to 30 minutes, until bubbling.